It’s finally happened. After so many years of speculation, an official app featuring all of Microsoft’s popular Office applications is available for the iPhone. It’s called ‘Office Mobile for Office 365 subscribers’, which is hardly the most attractive name, but a little besides the point at this stage. 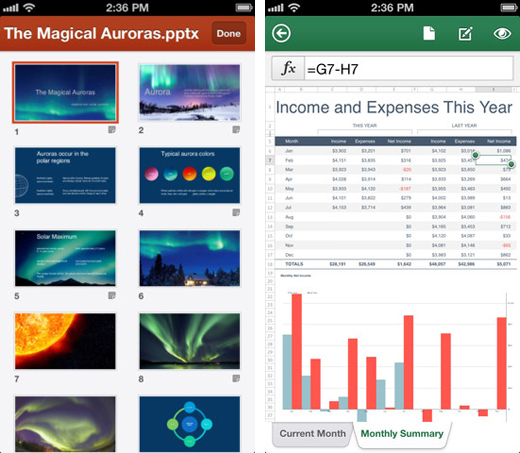 For iOS users with an active Office 365 subscription, it means they can access, view and edit any file previously saved in Microsoft Word, Microsoft Excel, and Microsoft Powerpoint. The launch will undoubtedly be welcomed by all Office 365 users, as it significantly increases the perceived value of the service. Documents are said to “look like the originals” and support rich media content such as charts, animations, SmartArt graphics and shapes. It also means that when the user makes an edit or writes a new comment for a document, all of the formatting and content will remain unchanged. The app pulls all of the users’ files from the cloud, meaning that Office documents can be stored and downloaded from SkyDrive, SkyDrive Pro and SharePoint. There’s also device syncing, so recent documents that have been edited or accessed on one device – say a desktop PC or Microsoft’s Surface tablet-laptop hybrid – will be shown in the iOS app through the recent documents panel. Similarly, when the user opens a document from SkyDrive or SkyDrive Pro, it will open up at the exact place where they last stopped reading, regardless of which device they previously accessed it from. With the app installed, iOS users can also instantly see and edit any Office documents that have been attached to an email message. So there’s no need to open documents in a third-party app and then export it again as an Office-compatible file format. 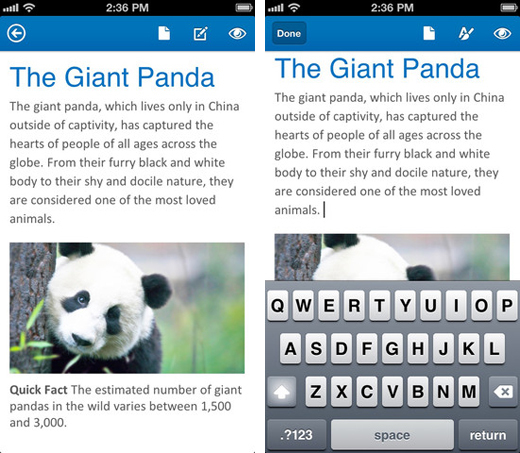 Microsoft Word, Excel and PowerPoint all look slightly different on the iPhone – they’ve been optimized for the smaller display size, after all – and there’s also a number of original presentation views, such as ‘Slide Navigator’ for browsing projects made in PowerPoint. Office 365 is a cloud-based service, but that doesn’t mean that the user needs an Internet connection to get to work. The app saves recently viewed and edited documents automatically, so that they’re always available – regardless of where the user is at the time. Documents can then be viewed and edited offline, with changes being submitted to the cloud when the user connects to a new network. The app has a few catches though. For starters, every users needs an Office 365 subscription, which isn’t exactly cheap. Microsoft Office 2013, installed on a PC, is also a necessity for some of the app’s most pivotal features, such as resumed reading and accessing recent documents. Office Mobile for Office 365 subscribers is available now in the App Store, but only for users based in the United States right now. It’s compatible with the iPhone 4 and up running iOS 6.1 or later, as well as the fifth generation iPod Touch. No support for the iPad though, which is a huge omission. So there you have it. Office on iOS. You asked for it. Microsoft delivered. Eventually.